Pedro Acevedo Jr., 29, 1246 Stanley St., New Britain, was charged on Sept. 5 with second-degree breach of peace. Denise Marie Ward, 36, 166 West St., first floor, New Britain, was charged on Sept. 5 with failure to keep narcotics in original container, use of drug paraphernalia and second-degree failure to appear. Onix Savier Garcia, 39, 7 Rhodes St., second floor, New Britain, was charged on Sept 5 with possession of narcotics, possession with intent to sell/dispense and possession of less than ½ ounce cannabis. Billy Arroyo, 31, 121 Wilcox St., first floor, New Britain, was charged on Sept. 5 with possession of narcotics, possession with intent to sell/dispense, possession of less than ½ ounce cannabis and violation of probation. Irene Alvarado, 29, 72 Clinton St., Apt. 1E, New Britain, was charged on Sept. 5 with violation of protective order. Luis Vargas, 36, 70 Osgood Ave., was charged on Sept. 5 with failure to respond to an infraction. Delilah Beauchamp, 35, 114 Benedict St., homeless shelter, second floor, Waterbury, was charged on Sept. 5 with assault on a public safety officer and second-degree breach of peace. Jessica Ayala, 33, 192 Daly Ave., New Britain, was charged with second-degree breach of peace and interfere with officer/resisting. Elizabeth M. Reade, 27, 22 Cone Spring Road, Avon, was charged on Sept. 5 with disorderly conduct and second-degree unlawful restraint. Joseph Paul Kozlowski, 55, 241 Arch St., New Britain, was charged on Sept. 5 with disorderly conduct. Luis Campos, 28, 296 High St., New Britain, was charged on Sept. 5 with third-degree assault and second-degree breach of peace. Tiffany Monique Chislom, 33, 535 Burritt St., third floor, New Britain, was charged on Sept. 5 with violation or probation and use of drug paraphanalia and possession of narcotics. Jazmin Rodriquez-Chardo, 40, 136 Overlook Ave., was charged on Sept. 6 with third-degree assault and disorderly conduct. Leslie Neris, 38, 136 Overlook Ave., second floor, New Britain, was charged on Sept 6 with third-degree assault and disorderly conduct. Desiree Ramos-Alvarez, 26, 685 West Main St., second floor, New Britain, was charged on Sept. 6 extradition arrest no warrant. Ronald Astacio, 36, 160 Miller St., first floor, New Britain, was charged on Sept. 6 with first-degree failure to appear. Andrew L. Seyler, 29, homeless, New Britain, was charged on Sept. 6 with two counts of secnd-degree failure to appear. Justin O’Brian Lebron, 20, 70 Stonegate Road, New Britain, was charged on Sept. 6 with second-degree failure to appear, interfering with officer/resisting and first-degree larceny. Piotr Mlyniec, 39, 75 Hayes St., first floor, New Britain, was charged on Sept. 6 with violation of protective order. Justin A. Serrano, 26, 105 Slater Road, New Britain, was charged on Sept. 6 with improper use-marker/registration, possible motor vehicle with changed ID number and third-degree larceny. Mariusz Majewski, 28, 91 Broad St., Apt. 2E, New Britain, was charged on Sept. 6 with failure to obey stop sign, improper turn/stop, traveling unreasonably fast and illegally operation motor vehicle under the influence of alcohol/drugs. Roderick D. Wrice, 63, 161 South Main St., Apt 107, New Britain, was charged on Sept. 6 with illegal operation under the influence of alcohol/drugs and following too closely. Luis E. Viera, 27, 113 Malikowski Circle, New Britain, was charged on Sept. 6 with third-degree strangulation/suffocation, second-degree unlawful restraint, criminal violation of restraining order, interfering with officer/resisting arrest and first-degree criminal trespass. David Ortiz, 27, 88 Ellington St., Hartford, was charged on Sept. 7 with second-degree breach of peace, second-degree threatening, second-degree harassment, criminal possession of a firearm/defense weapon and sixth-degree larceny. Alexander Molina, 26, 34 Douglas St., first floor, Hartford, was charged on Sept. 7 with two counts of probation violation. Johnny B. Booze, 35, 129 Bay Ave., was charged on Sept. 7 with three counts of second-degree failure to appear and second-degree breach of peace. Anthony Braica, 24, 84 Amity St., second floor, Hartford, was charged with Sept. 7 with third-degree criminal mischief, disorderly conduct, second-degree threatening and first-degree burglary. Alejandro J. Matinez, 23, 44 Hatch St., Apt. 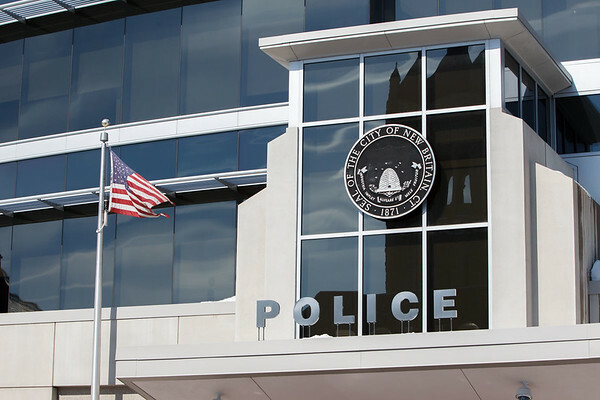 1, New Britain, was charged on Sept. 7 with failure to respond-payable violation, third-degree assault and disorderly conduct. Posted in New Britain Herald, New Britain on Friday, 14 September 2018 17:33. Updated: Friday, 14 September 2018 18:00.